All the Modern browser including the Chrome comes with a built-in PDF viewer that allows you to view PDF without the need of a PDF viewer. The fact that you can view any PDF online without having to download it locally first is convenient for many. After all, it is always great to have one less application installed on your PC. However, at times, Chrome PDF viewer may not work as it should and leaves the user frustrated due to some random problem. The problem can be anything from scrolling issues to downloading of PDFs automatically. This issue is different than Chrome Browser ERR_CONNECTION_RESET Error Problem. I decided to look for these common Chrome PDF viewer issues and make a guide listing all the problems and the fixes just so that you can save those few minutes not having to search the internet looking for a solution to your Chrome PDF viewer problems. Chrome browser as every other application on your PC works fine. While I am not sure what is causing this error, what I can certainly tell you is that you can fix the Chrome black screen issue with ease. Above all, you don’t even need to restart the Chrome browser or close the open tabs to fix the problem. In the Cortana/Search bar, type Device Manager. Click on the Device Manager icon to open it. In the Device Manager window, expand the Display Adapters section. Right-click on Intel HD Graphics and select Disable. Click Yes to disable Intel HD Graphics. Open Google Chrome, to see if the black screen issue is resolved. If yes, you need to enable Intel HD Graphics. 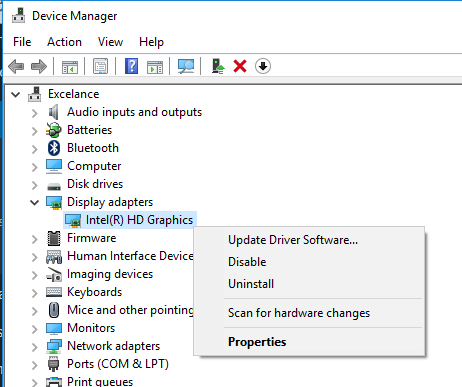 Go back to Device Manager and enable Display Adapter by Right-clicking on Intel HD graphics and selecting Enable. If you are facing problems with PDF page rendering with incomplete texts and pages, you can fix it by disabling hardware acceleration in the Settings. Click Menu and select Settings. Scroll down and click Advanced to expand the Advanced Settings. Scroll down to System section and turn off “Hardware acceleration when available” by clicking on the toggle switch. At times Chrome may automatically start downloading the PDFs to local drive instead of opening it in the PDF viewer. This can be annoying to many people who wish to preview the PDF files before saving to the local disk. Fortunately, the fix for this issue is simple. All you have to do is disable auto-downloading of PDF files in the Chrome settings. Open the Chrome menu (three dots on the top) and click Settings. Scroll down and click Advanced to expand the Advanced Settings section. Scroll down and click Content Settings. Scroll down to the bottom of the page and click PDF Documents. If the “Download PDF files instead of automatically opening them in Chrome” option is turned on, click the toggle switch to disable automatic PDF downloads in chrome. Now that you have disabled auto-downloading of PDF files, the PDF files from now on will open inside the Chrome PDF viewer. However, some PDF files still might auto-download as they cannot be opened without downloading from the server first. That’s a rarity and is manageable. At times PDF files may fail to open in the Chrome browser due to a conflicting third-party extension or just slow internet connection. If your internet connection is all right, then a third-party Chrome extension might be the culprit here. If the PDF files open in Incognito Mode, it is most likely that a third-party extension is causing the problem. Disable all the extensions by going to Menu > Tools > Extensions and then enable them one by one to figure out the problematic extension. If the PDF files are not working even in Incognito Mode; your PC might be affected with a malware that affects browser’s functionality. 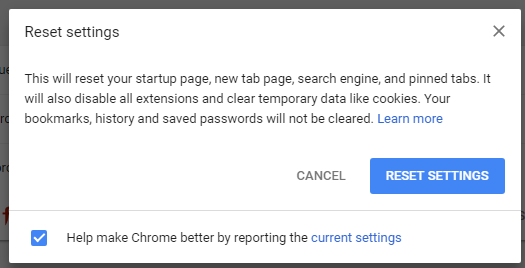 Fortunately, Chrome has its own malware detection and removal tool. Open the browser and type chrome://settings/cleanup in the address bar and hit enter. Or you can also access it from Menu > Settings > Advanced > Clean Up Computer. Click the Find link next to “Find and remove harmful software”, and the browser will start checking for malicious software. If found, it will ask you to perform some on-screen instructions to clean up the PC. Chrome browser auto-updates, whenever there is a new update is available. Still, you may want to check for the updates just in case if the browser failed to update itself. If an update is pending, download the latest update. The browser will close and reopen again so make sure you save all the open tabs in Chrome before starting the update. To do this, go to Menu > Help > About Google Chrome. While Cache and Cookies causing problems is a rarity in the modern browser, clearing them can resolve the issue if any. Click Menu > More Tools > Clear Browsing Data or press Ctrl + Shift + Del. Advanced tab to see if any other data needs to be cleared along. 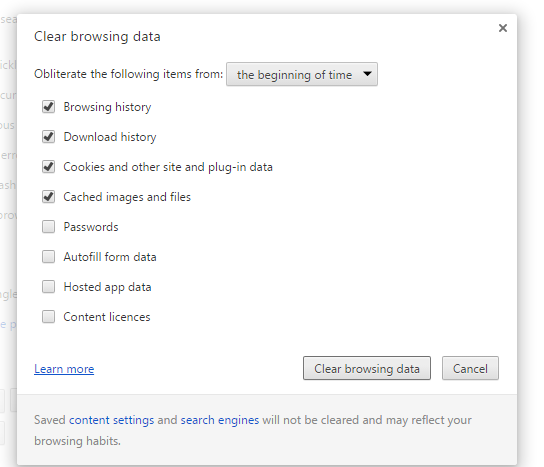 Resetting the Chrome browser is the last measure to fix any issue with the browser. However, if nothing seems working, resetting the Chrome browser can do the trick. Click Menu and open Settings. Click Advanced to expand Advanced Settings and scroll to the bottom of the page. Click Reset Settings to Original Defaults and click Reset Settings to confirm. You may want to know that resetting the browser to factory default will erase all and any saved data from the browser except saved password, history and bookmarks. The extensions will be disabled as well. So, these are the solutions to fix the common Chrome PDF Viewer problems. If resetting the browser did not work, try to uninstall and re-install Chrome browser as a last resort. Do let us know if any of the fixes worked for you in the comments so that other readers can straight jump into the working fix.